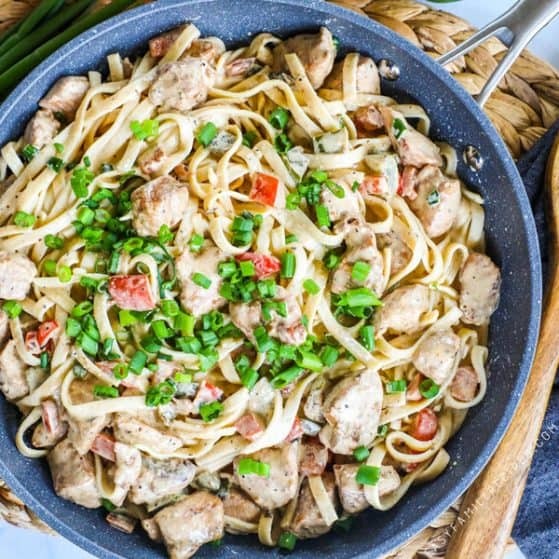 This Cajun Chicken Pasta is packed with delicious cajun seasoned chicken breast chunks and sweet bell peppers all enveloped in a creamy alfredo style cream sauce. 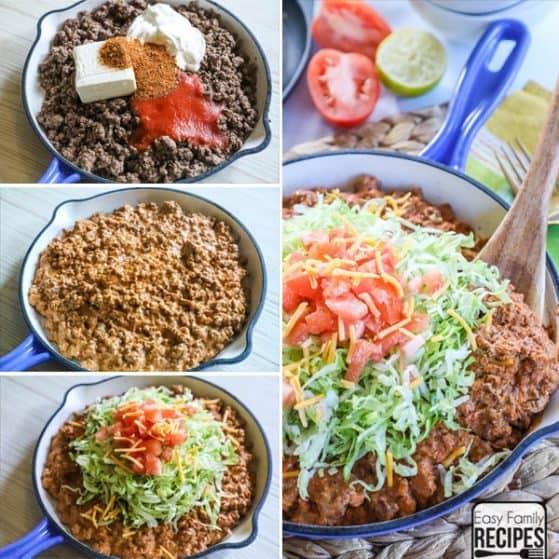 This is the ultimate filling and flavorful dinner and is surprisingly quick and easy to make! 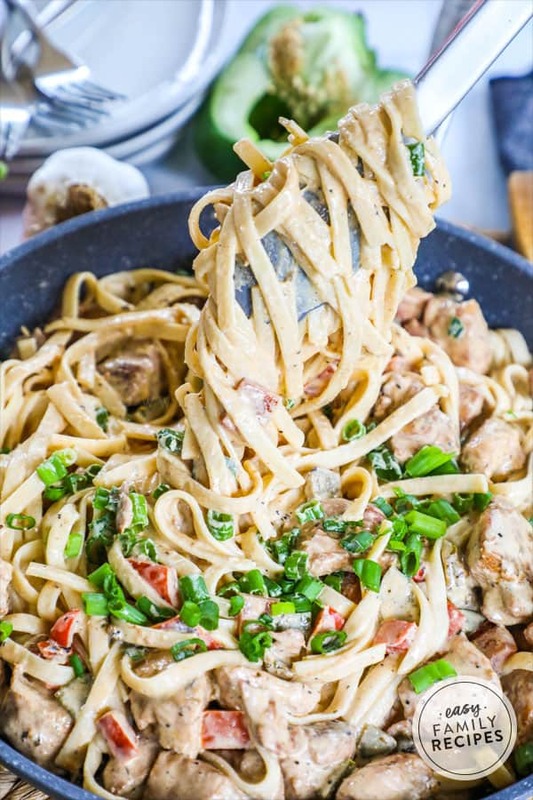 If you love hearty pasta dishes, then this Creamy Cajun Chicken Pasta will be a hit! The reason I most love this recipe is because it is crazy delicious. However, the second best thing about this recipe is that it is super easy to make and just uses one skillet and a pot to boil the pasta. Everything is super simple and it comes together quickly and easily without sacrificing any of the rich, amazing flavors. This recipe uses a base made with my homemade Cajun Seasoning mix. It is really great because you can whip up a batch and it will stay good for over a year in the cupboard. You can sprinkle it on anything from meats, to veggies, to potatoes, and even use it in sauces (like we do here) or salad dressings. It is really the secret of why this pasta is so delicious! This dish is one that is definitely hearty and filling enough to stand on it’s own. You have everything you need in one dish- protein, carbs, dairy, and vegetables! So if it is a busy night, you really don’t need to put anything else on the table except for this pasta. 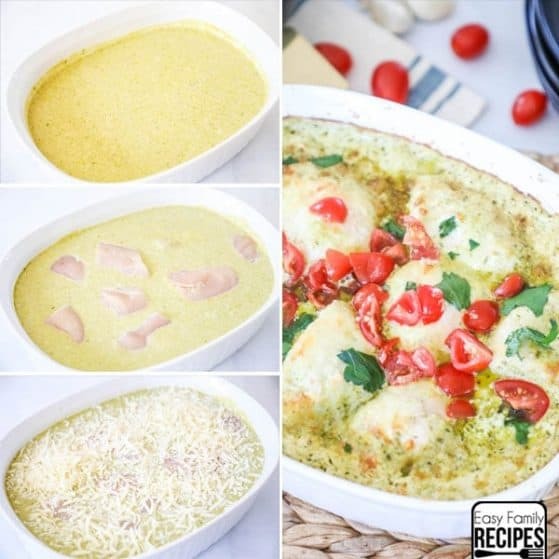 If you do want another dish to round out the meal, here are a couple of dishes that I serve when I want a fancier presentation, or I am feeding a crowd. If you want this taste of Cajun Chicken Pasta with out the carbs, try some of these pasta substitutions. This meal is super simple to make and comes together quickly. I am going to share some of my tips and tricks for making this meal taste the best and be the quickest possible. 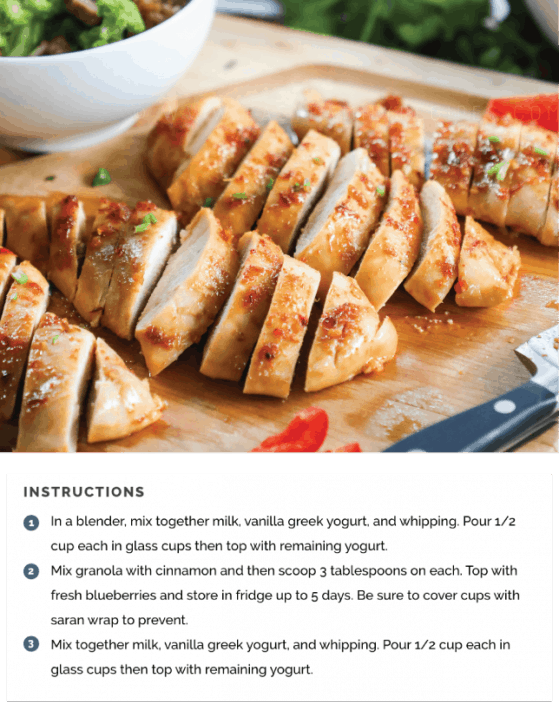 Make sure to scroll to the bottom to grab the full printable recipe card. Plan this dinner out and it will run super smoothly. If you do it all like clock-work, this is easily a meal prepared in as little as 30 minutes! I always start my water to boil first. Then cut the chicken and let it marinate. Chop the bell pepper and add the pasta to the boiling water. While the pasta boils, cook the chicken. Shortly after the chicken is done, the pasta will be ready to drain. Then use the chicken skillet to make the sauce. Last, but not least, put the meat and pasta in the cajun alfredo cream sauce and then toss it all together. 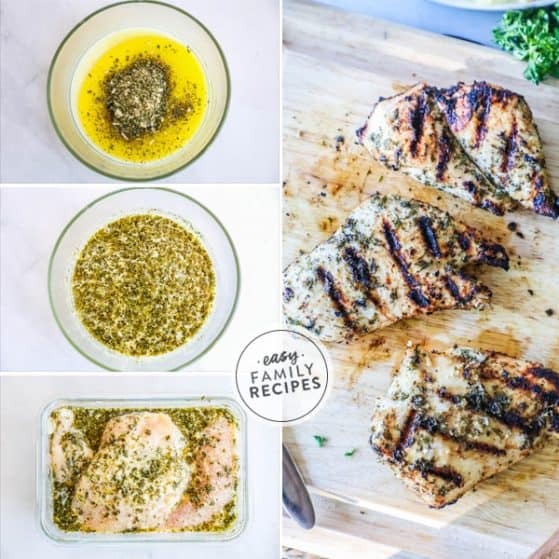 When you cook the chicken it is important to do a few things to get the absolute best results ie the gorgeous and flavorful sear on the outside of the chicken! Make sure the skillet and oil are nice and hot before adding the chicken. When you add the chicken spread it into a single layer. Don’t over crowd the pan or the chicken will steam instead of sear. Resist the urge to stir! We want the chicken to get that nice caramelized brown coating on on the outside. It can’t do this if it doesn’t have long enough to sear. Wait 3-4 minutes then you can turn the pieces over. If this is too labor intensive with all the little pieces, you can also use this same method with thinly sliced chicken cutlets. Once you turn them, the next steps move fast. 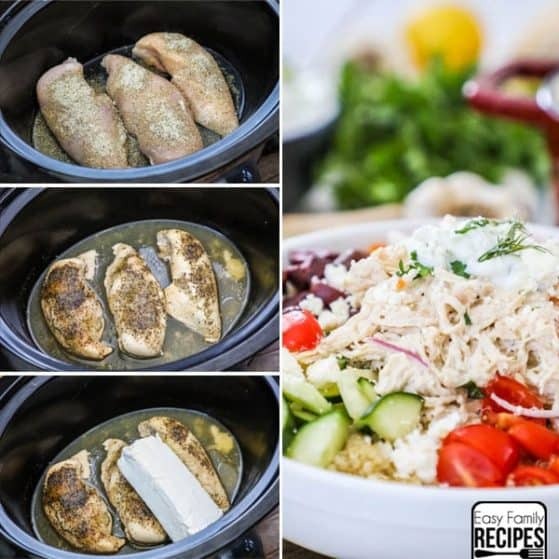 Make sure to read through the steps so you can do them all without over cooking the chicken. This sauce is an alfredo type sauce. 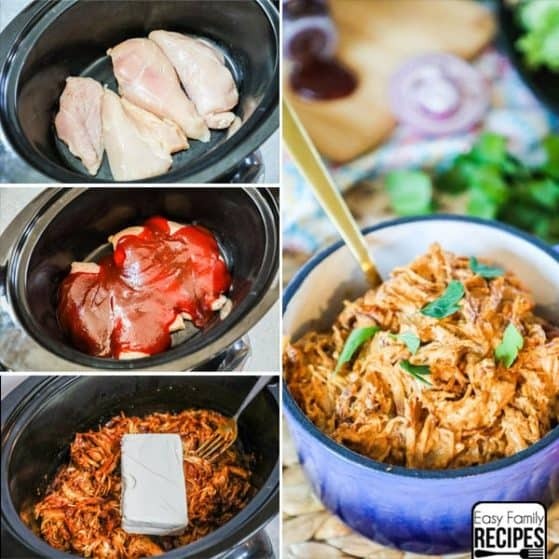 It is rich and delicious and also pretty quick and easy when done right! Melt the butter with the seasonings. Don’t get the heat up too high (like we needed for the chicken) or it could burn both the seasonings and the butter. When you add the cream, cream cheese, and parmesan, you need to whisk pretty regularly. If you want the process to go a bit faster, you can cut the cream cheese into chunks, or pre-soften it in the microwave to help it melt and combine with the sauce more quickly. Bringing the sauce to a boil will help thicken it. I like it not to just bubble on the edges, but really be a rolling boil for just about a minute. As the sauce cools it will continue to thicken. Can I make this dish lighter? Substitute half and half for heavy cream. This will make the sauce a bit more thin and a tad less rich but can still produce a good result. Use light cream cheese instead of traditional. Do not use fat free cream cheese as it doesn’t melt and combine the same as regular and light cream cheese. 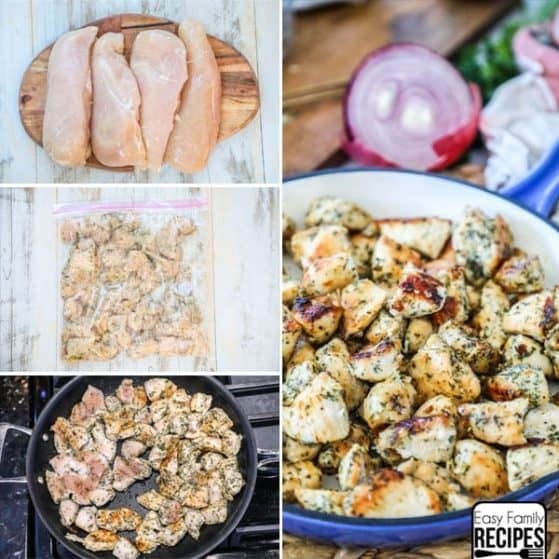 Can I use other cuts of chicken in this dish? The Cajun Chicken can be prepared with other boneless, skinless varieties of chicken such as chicken tenderloins or chicken thighs. The cooking time may vary if different cuts are used. All chicken needs to be cooked to 165˚F internal temp to follow food safety guidelines. Can this recipe be made Gluten Free? The only thing that contains gluten in this recipe is the pasta, so if you would like to make this recipe gluten free you can use a gluten free pasta, or substitute spaghetti squash or zoodles for noodles. Also, do make sure to use my homemade Cajun Seasoning, as some store bought seasonings contain gluten. 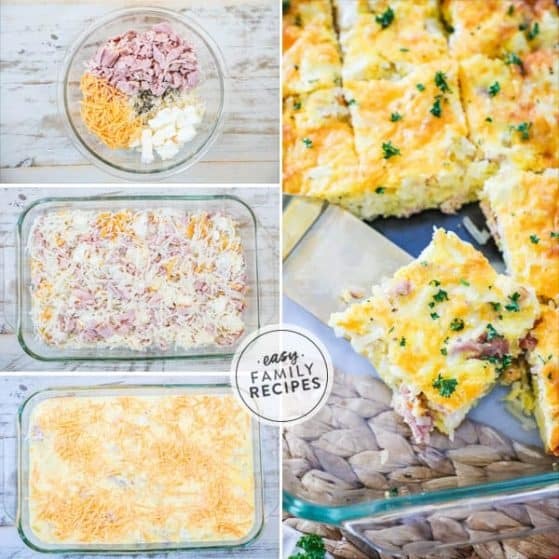 If you enjoyed this recipe, I have many more to ease the dinner burden for another busy night. 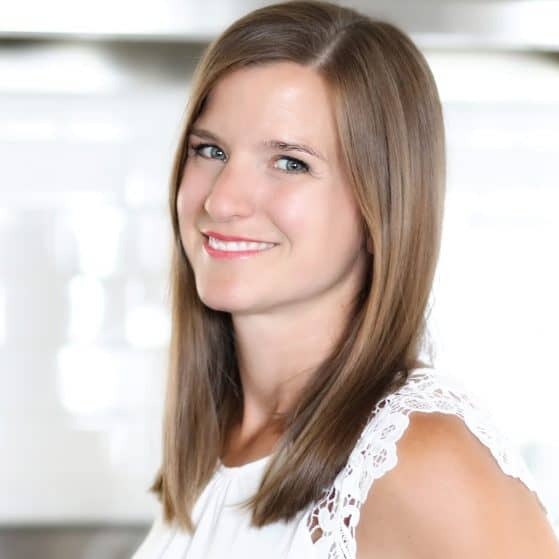 Make sure and sign up for my e-mail here to get the newest recipes regularly in your inbox. 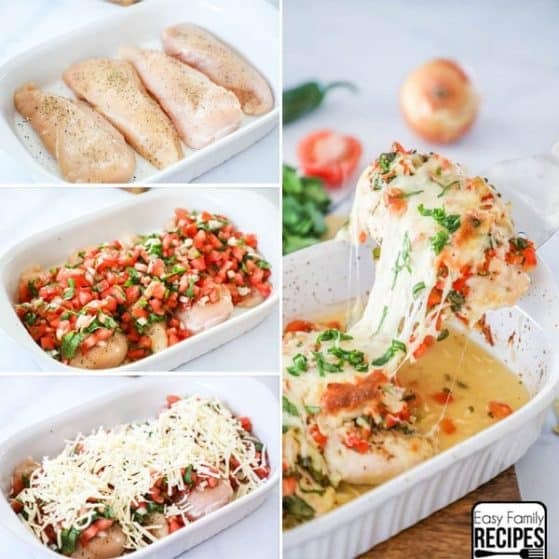 Skillet Ranch Chicken – My #1 go to recipe! 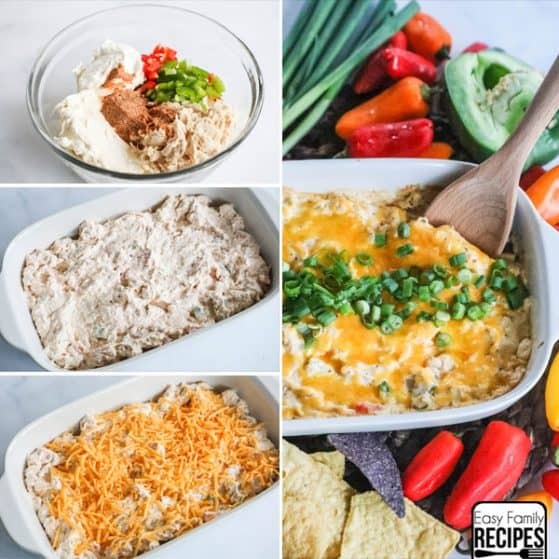 Green Chile Chicken Bake – Reader favorite! 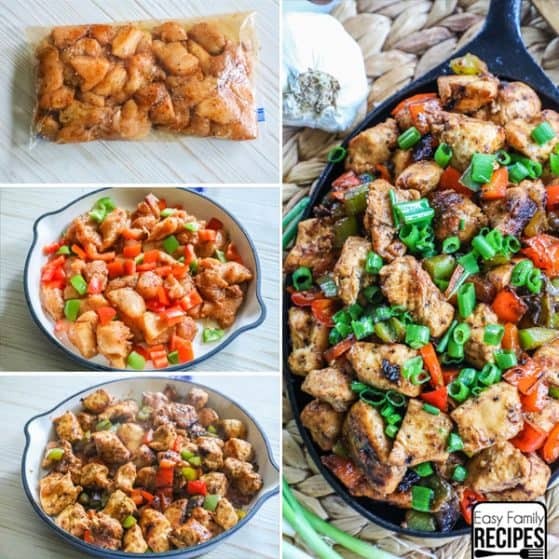 Chop chicken into 1 in chunks. Place in a zip top bag with 1 tbsp of olive oil and cajun seasoning. Mix the chicken until all is coated with the seasoning. Let marinate, while you chop the bell pepper into bite sized pieces. Cook pasta per package directions. Drain and set aside. Once the chicken is done, remove the chicken from the skillet and set set aside. In the skillet melt the butter with the seasoning over medium heat. Add the cream, cream cheese, and parmesan and whisk until the cheese is completely melted and bring the mixture to a rapid boil for one minute, then remove from heat. Toss the pasta, chicken and peppers with the sauce until coated. Sprinkle the green onions over the top of the pasta. Serve immediately. Enjoy! I am not a nutritionist or dietitian. Nutrition facts provided based on my best estimation for the recipe and may not be accurate depending on what brands you use or modifications you make to the recipe. I recommend using a nutrition calculator with the exact brands and measurements you use for the most accurate calculation.